Learn the impact your DNA may have on your omega-3 DHA levels, and discover how much DHA is in your breast milk with the EverlyWell companion kit. 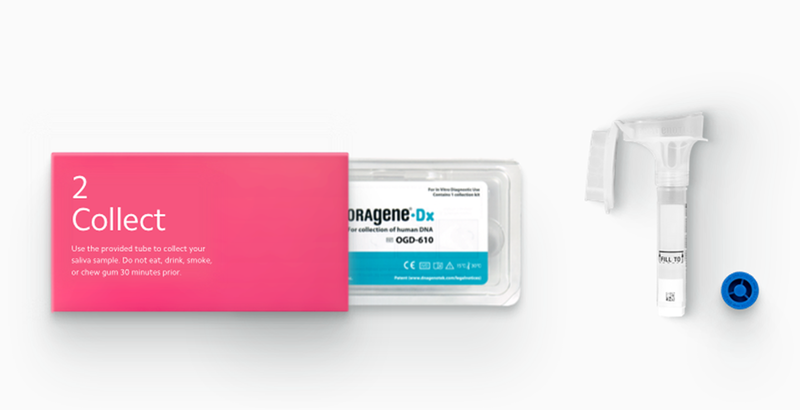 In addition to getting your DNA sequenced, you’ll also provide a small breast milk sample using this EverlyWell companion kit. Your genetic results will tell you tell you if your personal genetics may affect the levels of DHA in your breast milk. Note: EverlyWell Breast Milk DHA+ requires returning two sample collection kits, one to Helix and one to EverlyWell. Your EverlyWell kit will be sent once you receive and register your Helix kit. 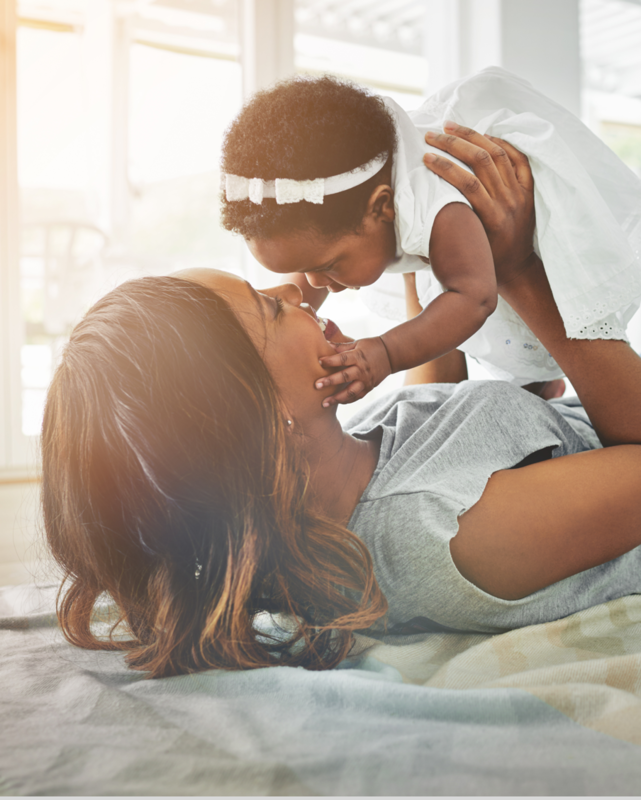 Breast Milk DHA+ is designed for women who are currently lactating or who will be lactating within 6 months and want to monitor their breast milk’s overall percentage of DHA, as well as learn what role their genetics may play. Your breast milk sample results will tell you whether your milk’s DHA levels currently fall within healthy ranges for a breastfeeding mother. Your genetic results will tell you if you have a genetic mutation that may affect your DHA levels. All you need to do is place a few drops of your breast milk on a sample collection card, and provide a small saliva sample. 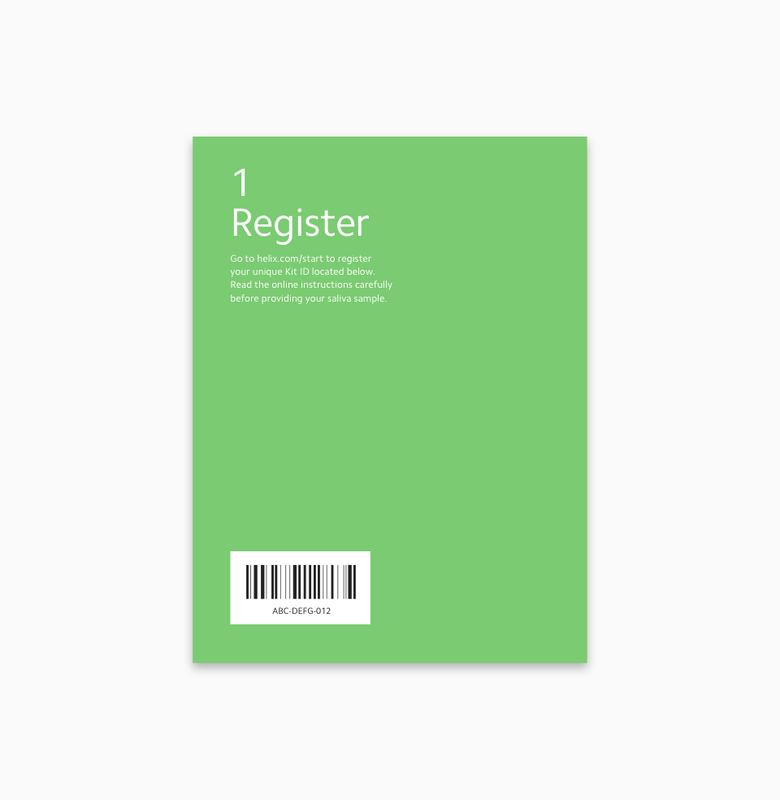 Easy-to-follow instructions and sample collection materials are included so that you can provide your samples privately on your own time. Get access to evidence-backed guidance on dietary and lifestyle changes that may affect your DHA levels which, in turn, may influence the DHA levels in your breast milk. Your genetic results will tell you if your personal genetics may affect the levels of DHA in your breast milk. Learn the impact your DNA may have on your omega-3 DHA levels, and discover how much DHA is in your breast milk. The DHA levels in your breast milk indicate the amount of DHA your baby receives. Your baby needs enough DHA to develop in a number of areas including their eyes, nervous and immune system, and cognitive abilities.2 Because the brain’s growth plays a major role in the early years of your baby’s development, they require a consistent, optimal intake of DHA for up to two years after they’re born. EverlyWell lets you take control of your health! With a simple at-home sample collection, EverlyWell gives you the power of strong science and the benefits of convenient lab testing. It’s more than test results, though—EverlyWell products also include detailed explanations of what your results mean, and offer insights on how you can take action to improve your wellness. The nutritional content of breast milk is largely influenced by the diet of a mother, but genes do play a role. Genetic variants related to DHA levels are involved in the metabolism of omega fatty acids to DHA. Your DNA may identify a predisposition to lower levels, but your diet may make up for this difference. Genetics can help, but your diet has the biggest impact on DHA levels. Our understanding of how genetics influences DHA levels in breast milk will improve with more research. Individuals should consult a physician or health care professional before making dietary changes or beginning supplementation. Yanni Papanikolaou et al., “U.S. adults are not meeting recommended levels for fish and omega-3 fatty acid intake: results of an analysis using observational data from NHANES 2003–2008,” Nutrition Journal 13 (2014):31, doi:10.1186/1475-2891-13-31. Ricardo Uauy et al.,”Essential fatty acids in visual and brain development,” Lipids 36 (2001): 885, doi:10.1007/s11745-001-0798-1. This product checks the FADS1 gene, which affects your ability to metabolize DHA and ultimately store it in your body. 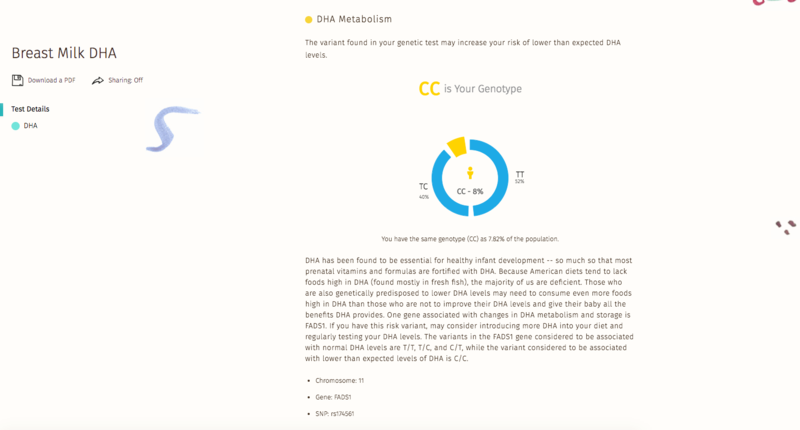 Your results will contain your personal genetic information and how they may or may not affect your DHA levels. What biomarker does this product check? This product checks the DHA levels in your breast milk. There is no recommendation for frequency of checking DHA levels in your breast milk. Mothers who test with lower than desired levels may want to check again after making dietary changes or beginning supplementation to see how their levels have changed. Mothers may also wish to re-check if they have made a change in their diet due to other circumstances, like an allergy being discovered in a family member that prevents foods rich in DHA from being prepared in the home. Mothers should consult a physician or healthcare professional before making dietary changes or beginning supplementation. What is the sample collection process for breast milk? All you need to do is place a few drops of your breast milk on a sample collection card. 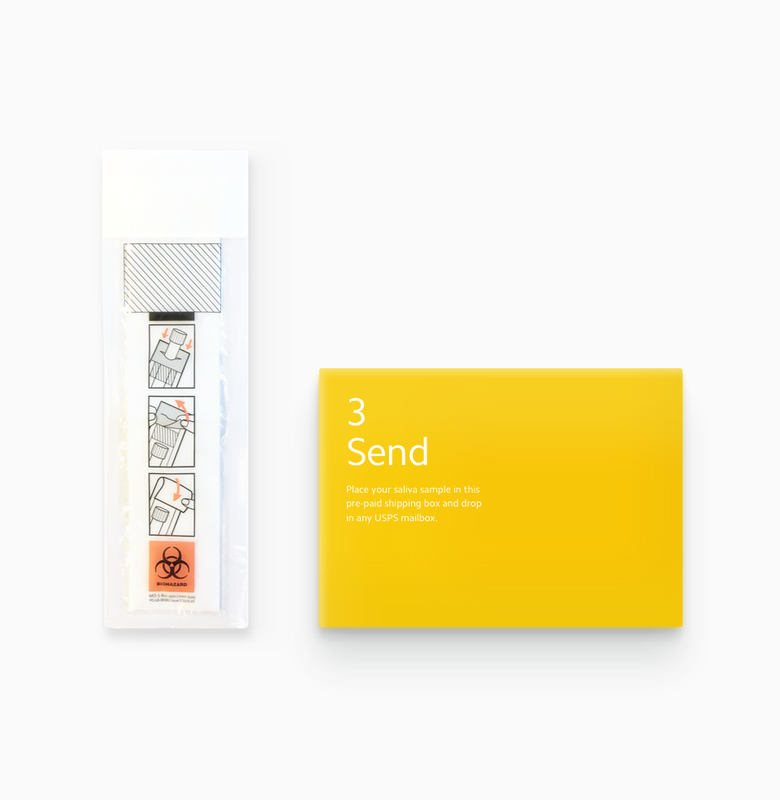 Included with your EverlyWell sample collection kit are easy-to-follow instructions and materials to collect your own sample privately on your own time. No. When you order Breast Milk DHA+, you answer a few health history questions, and Helix automatically shares your answers with EverlyWell and a licensed physician in your state to make sure the DHA biomarker kit is right for you. Do I have to get sequenced and provide a breast milk sample to use this product? Yes. 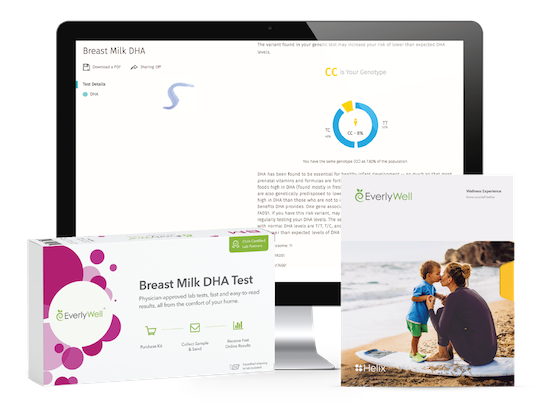 In order to use Breast Milk DHA+, you must provide a breast milk sample using the EverlyWell biomarker kit and a saliva sample using the Helix DNA kit. 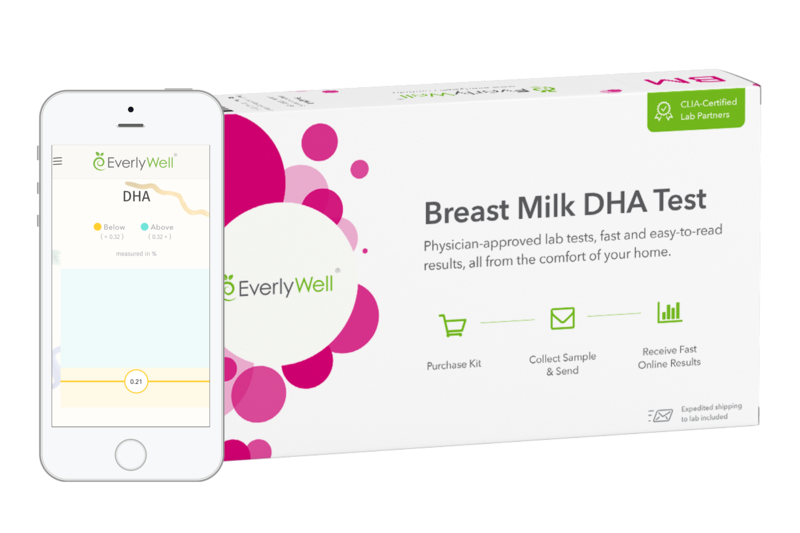 Your EverlyWell Breast Milk DHA+ biomarker results will be available in 5 business days or less from the time your breast milk sample arrives at the lab. 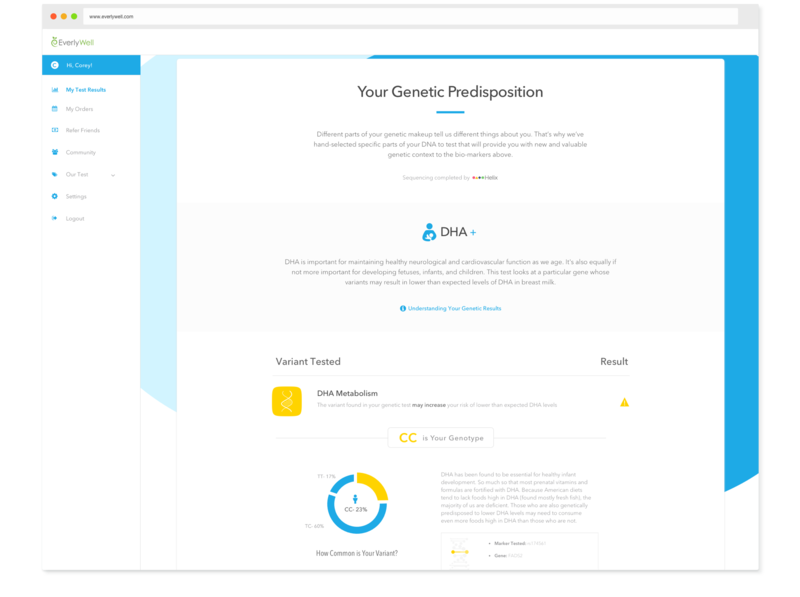 If you’re already sequenced by Helix, your DNA results will be available at the same time. If you haven’t yet been sequenced by Helix, your DNA results will be available 6-8 weeks after your saliva sample arrives at the lab.